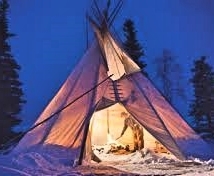 2 hours aboriginal demonstrations ice fishing tour with fishing nets. Complimentary fried northern white fish is provided for lunch. Tour offered in winter season only from December until early April. Dates are subject to change due to weather conditions and lakes ice thickness. On this tour you will learn aboriginal traditional ways of catching fish using fishing nets. Your tour starts with hotel pick ups and drop off on frozen Great Slave where your fishing guide will be waiting for you. Your aboriginal ice fishing experienced starts with your fishing guide demonstration of aboriginal ice fishing show casing equipment used for ice fishing and demonstration of equipment proper use. On a lucky day you will be able to witness pike, pickerel or white fish being caught on nets. At the end of tour you will be saved local pan fried fish. Tour ends with hotel drop off. Due to the nature of this tour proper warm winter clothing is highly recommended.